KPI is an Oracle Platinum Partner and one of Oracle’s most trusted partners for implementing BI solutions. KPI enables organizations to foster a data-driven culture with powerful, visually stunning analytics. KPI Cloud Analytics enables the integration of enterprise applications (cloud and on-premise) using Oracle BI technologies to provide an end-to-end system capable of comprehensive cross-functional analytics. With a pre-built data model, pre-built ETL, and pre-built analytics, KPI Cloud Analytics gathers information from multiple sources and drives insightful decision making across the enterprise. This solution can be deployed both in the cloud and on premise. KPI’s pre-built templates, dashboards and reports help accelerate the implementation of Oracle Analytics Cloud Service. From requirements review and design to training, KPI can help you move to the intuitive, self-service cloud analytics application in just weeks. As a leading Oracle BI implementation partner, KPI can help you develop a BI roadmap incorporating an architecture that can be extended to meet enterprise-wide goals as they evolve over time. 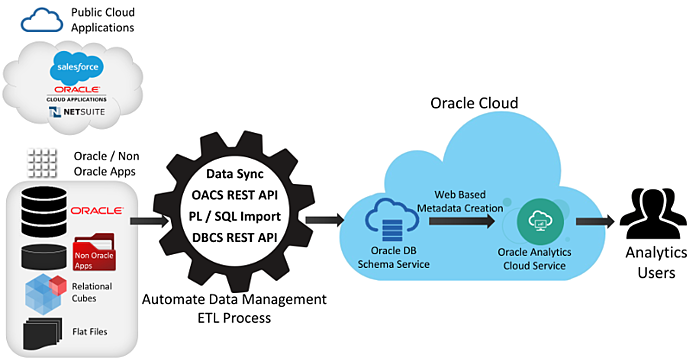 Our methodology accelerates the implementation process and includes definition, installation, configuration, development, deployment and documentation of your personalized Oracle BI platform. Our solution includes pre-configured templates, user-friendly interfaces, interactive dashboards and ad hoc reports to ensure immediate return on investment. KPI’s data integration service capabilities acquire structured and unstructured data from virtually any source, integrate and deliver quality data in a high-performance environment. Our expertise in cutting-edge ETL tools including Oracle Data Integrator supports the delivery of scalable and reliable data integration solutions to our clients across the globe.